This work comes from a conference held at the University of the Holy Cross in Rome, Italy. It serves as a precursor to the Holy Father’s announcement of the extraordinary jubilee Year of Mercy (The Solemnity of the Immaculate Conception, December 8, 2015 through the Solemnity of Christ the King November 20, 2016). Pope Francis has called two Synod meetings of Catholic bishops to the Vatican. They focus on issues of family life and how the Church might use its teachings on mercy to address difficult contemporary family situations, including divorce and remarriage. With these words of direction and inspiration, the presentations here answer the Holy Father’s call to reflection on the family issues of divorce and remarriage. 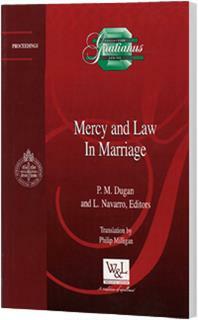 Written with great intellect and great compassion, their authors call everyone who works in the marriage process to bring Mercy into the process first, and justice will follow. Professor Carlos José Errázuriz M.